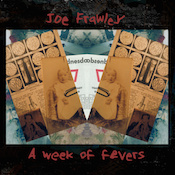 Joe Frawley does not offer an explanation of what A Week of Fevers is supposed to be about. Well, good. That means I get to peer into this latest conglomeration of sound files, vocal snippets, electronic treatments, shreds of old songs, and melancholy piano and bring it together in my own head. I think that tends to be what the guy expects of us anyway, we listeners. What do we hear in all this, what storyline do we come up with? Or do we find something of our own story buried under the dust when it stirs? As always, the piano is the voice that guides us. Heavily echoed, it has the tone of an old, well-loved instrument whose sound comes to us from back then, whenever that may be. On this album that sense of a sound out of time is enhanced by the use of songs from the 30s and 40s (hello, Sammy Cahn!) drifting through the background. The opening track, “Monday (Molly),” latches onto the repeating phrase/theme “I’ll see you in my dreams” as Frawley washes the scene in soporific white sound to describe the boundaries of the dreamspace we’re heading into. Later, the idea comes back in a somewhat less pleasant form on “Sunday (Recurrence),” where a woman’s voice in the distance sings through some form of filter to give it a chopped, tremolo effect. Any time I listen to Frawley, the overarching sense I get is of standing in a room and being able to see captured moments from everything that has ever happened there. A veil between worlds blows in the wind and I might hear a baseball game, a lovers’ conversation, a confession, often not distinct enough for me to understand anything more than the tone of it—but which I understand at a core level. Some moments are given more clarity. “Go on,” a man’s voice says, abruptly appearing at the end of “Wednesday (Memory Forms).” “I don’t know what happened,” a woman replies. We have been hearing her sharp, almost gasping breaths—a signature Frawley snippet—leading to this moment. The man says, “You can remember everything now.” Where does this moment put us? Is it happening in the room now, or are we still peering into some sliver of what was? I love that one line for the way it is both speaking to the woman in the clip, but also directly to us. Meanwhile, all around us, Frawley is bending sounds, chopping them, wavering them, hiding them in his hands and opening them just for a second to let the sound out. The resonance of the piano morphs into fading ambient washes that form a quiet backdrop of pure feeling. Joe Frawley’s forte is creating tableaux that play out in sound and sensation, in making stories that happen one small, distorted moment at a time. He taps into our desire to see into other people’s lives and minds, piques our curiosity and our need to know the story—and all the while, although we may not realize it, we are making the story up as we go along. Great work as always from Mr. Frawley.